It’s a new month! Which means we get a brand new creativity exercise! Are you ready to get inspired and take pictures? I am. I loved last month’s exercise. If you’re just now joining us, be sure to check it out. Also, you can subscribe so that you don’t miss another one. So, April is the perfect month (I may be a little biased since I was born in April … ) to do a 30 day photo challenge! April only has 30 days! If you are just joining in on these creativity exercises, don’t worry! You don’t have to start in April or even in the beginning of a month. Just start it! Download the document, print it out, hang it on your wall, follow the prompts, and share! These exercises are meant to get your creative juices flowing. So, let’s get started, shall we? This challenge is all about thinking. You can either follow the prompts that I have given, make your own prompt, or just take a picture a day this month! Up to you. There aren’t really any rules here. It’s pretty open to your interpretation. If you decide to follow the prompts, don’t let them drag you down! They don’t have to be perfect. The point of this exercise is to take 30 different photos. If one of the prompts are getting in the way of you taking a picture that day, then take a picture of whatever you want. The idea is to walk away with 30 photos by the end of the month. I did throw in a couple of self portraits. Get creative with these. Find ways to push past the typical ‘selfie’. Set up a tripod. Include the environment. Do something in them. Don’t look at the camera. Self portraits can be tricky, but with these tips, you should be able to conquer them easily! If you’ve ever tried to do a 365, you know how hard it can be. Taking a picture everyday is difficult. But it does push you and help you grow. Here are some ways to stay motivated and push through this exercise. don’t beat yourself up if you miss a day – no seriously, don’t. It’ll only make you feel worse. Instead, take 2 images the next day. You’ve got this. Read the prompt the night before – this’ll help you think of how you can get the image you want the next day. It’s totally OK to stage an image! Don’t let the prompts bring you down – if a prompt is too hard, take an image of whatever you want! Keep your camera in a place where you’ll see it. I keep mine in the middle of my living room so that it’s easy to grab! Take your camera when you go out – you never know, you just might see something that’s perfect for that days prompt! Have fun – this is the most important. Don’t stress over it like it’s a chore. This is supposed to be fun! When all is said and done, make sure you put your images all together (in a grid, a calendar, etc.) so that you can see all the fun you had. 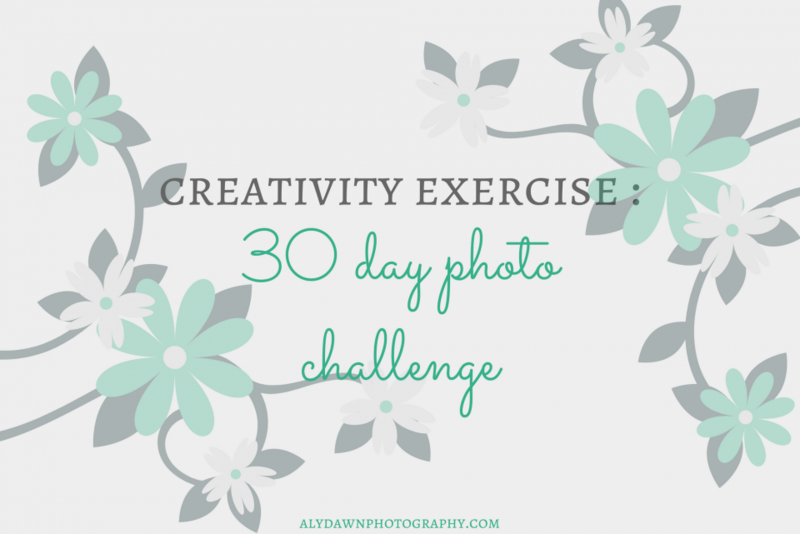 Share your 30 day photo challenge with everyone! On Instagram, Facebook, you could even print it out! 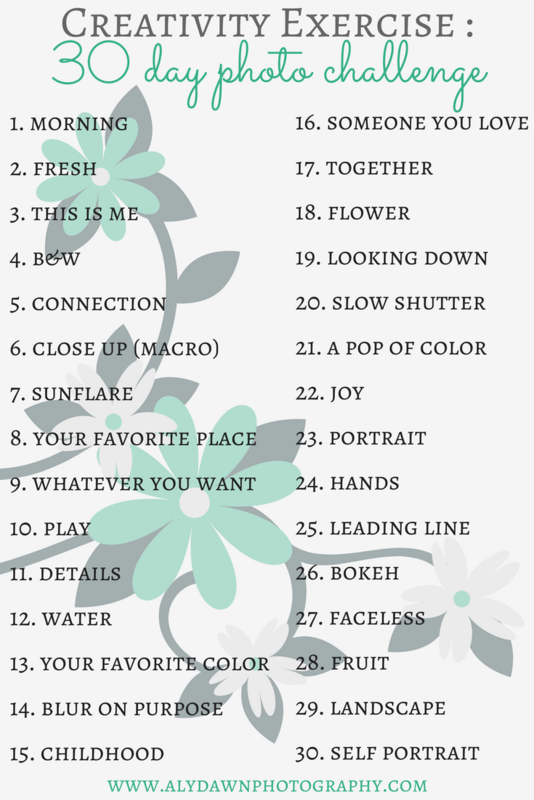 If you complete this photo challenge, please, show me below!